Gov. Greg Abbott’s "School and Firearm Safety Action Plan" — released earlier this month in response to the deadly Santa Fe High School shooting — is filled with ideas on how to prevent school shootings by “hardening” schools to make them more resistant to attackers. But one part of his plan pushes a softer approach: Hiring more counselors to focus on student mental health. Texas school officials and experts say they're heartened by Abbott's proposal, but they think the governor should go further to improve mental health resources in schools. Simply identifying students who are having a mental health crisis isn't enough, said Tammi Mackeben, president of the Lone Star State School Counselor Association. Teachers, administrators and counselors all need to work together to improve overall student mental health, with counselors ready to step in once problems appear, Mackeben said. "Counselors can’t be the only individuals that are recognizing when students have mental health issues," Mackeben said. Texas is one of 20 states that don't require schools to have counselors, and it has the fifth highest student-to-counselor ratio in the country, with an average of 684 students for every counselor, according to the American School Counselor Association. School counselors are often given tasks like scheduling and administrative work, Mackeben said, limiting the time they can focus on students' mental health. A counselor is “the only person on campus who is trained in mental health issues, so we’re trying to get that message out that they are the person on campus to deal with these kind of issues,” she said. Abbott’s plan recommends freeing up school counselors to focus on students' mental health and behavioral needs rather than on tasks like scheduling and college applications. To do that, Abbott recommends allowing schools to shift money toward counseling and mental health services. But teacher organizations like the Association of Texas Professional Educators say schools don’t have excess funding to reallocate. “Districts are strapped with the amount of money that they have now,” said Monty Exter, a lobbyist for ATPE. “Simply telling them to spend the money how they see fit won’t work. They’re not spending it on crazy or frivolous or unimportant things." Abbott also recommended expanding “mental health first aid” training programs for school district employees. The program gives teachers, administrators and staff the tools to understand and identify mental illness until someone with further training can respond. 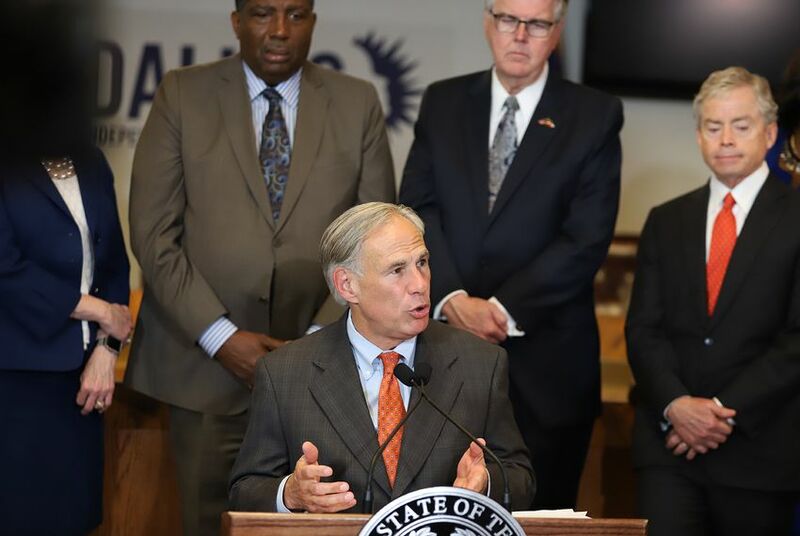 During roundtable discussions on school safety following the Santa Fe shooting, Abbott repeatedly voiced the need for more school counselors, but experts say counselors are only part of the solution for helping troubled students. Ron Avi Astor, a University of Southern California professor of social work and education, worked with a coalition of school violence experts to create a school shooting prevention plan following the Parkland High School shooting in Florida earlier this year. Their plan, like Abbott’s, recommends greater student access to school counselors, but placed an emphasis on creating a positive climate in schools to prevent students from feeling isolated. Several Texas school districts are already approaching school violence with methods similar to those recommended by Avi Astor. For example, Dallas Independent School District uses a method called social and emotional learning, which integrates self-awareness, self-management, social awareness, relationship skills and responsible decision-making into classroom teachings, said Juany Valdespino-Gaytan, Dallas ISD's executive director of student engagement and counseling services. Valdespino-Gaytan echoed Avi Astor's thoughts on Abbott’s student mental health recommendations. Disclosure: The Association of Texas Professional Educators has been a financial supporter of The Texas Tribune, a nonprofit, nonpartisan news organization that is funded in part by donations from members, foundations and corporate sponsors. Financial supporters play no role in the Tribune's journalism. Find a complete list of them here. Twice a week, these Texas students circle up and talk about their feelings. It’s lowering suspensions and preventing violence.